Once the early optioneering process is complete and the configuration of the proposed building has been established, the decision on the framing material has usually been made. However the design will not yet have progressed sufficiently to prepare detailed cost information on individual products and systems, necessitating the presentation of costs as a rate per m² of gross internal floor area (GIFA) based on the adjustment of typical cost ranges for similar buildings. As the design develops and more information becomes available, the cost planning methodology changes and it is possible to quantify the key materials and test the initial allowances made at the outline design stages against the actual building. 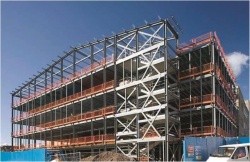 During the detailed costing of structural steelwork, a number of factors should be considered alongside the overall volume of materials, including the use of specialist systems, allowances for connections and fittings and the required fire resistance period and choice of materials to achieve it. Consideration of these key factors along with early consultation with the supply chain, in particular with a steelwork contractor, can ensure that realistic costing of the steel frame and associated elements is maintained and improved as the design develops. 2 Minimum tonnage = minimum cost? The purpose of initial cost estimates is to enable the project team to make timely decisions on the key elements of the design, such as building form. Once these have been agreed attention turns to detailing the major elements of the building and preparing realistic costs is key to enable options to be quickly assessed. For the steel frame this can include the consideration of specialist systems to optimise floor-to-ceiling heights or integrate services and comparisons of possible fire protection methods for the structure. The movement from costing the structural steel frame from a m² GIFA basis to a per tonne basis is a significant change in the costing methodology, which occurs as it becomes possible to quantify elements within the building and allocate rates to individual measured items. As the design progresses, detailed information on the proposed frame will become available from the structural engineer - drawings showing the frame configuration; cores and shear walls; columns and beams; sections sizes and types; floor construction details and the strategy for integration of mechanical and electrical services. Connections and fittings (bracing, stiffeners and the joints that transfer forces between the structural elements). The volume of secondary members should not be overlooked as these can account for a significant proportion of the overall steel weight and cost. A number of key factors influence the design of the primary members. The column locations will generally be determined by the architectural layouts, which then determine the configuration of the other primary members. The size and weight of the steel members will be determined by the loads, which include permanent, imposed and wind loads. The permanent load is the building’s own weight; imposed loads are those loads imposed on the building during its use and vary for different functions, and wind loading will vary depending on the location of the building. [top]Minimum tonnage = minimum cost? 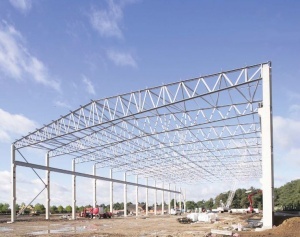 During the detailed design stages, cost estimates of structural steelwork will break the design down into individual components – columns, beams, special sections and so on - and will separately consider connections and fire protection. When the primary and secondary members have been sized and selected, the length of each structural member can be measured and multiplied by the relevant weight (expressed as kg/m) to quantify the total weight. To calculate the cost of the structural frame, each of the different components will have a rate per tonne applied and then totalled. This rate includes all elements of the cost of the profile – the raw material, detailing, fabrication, transportation and erection. Separate cost allowances are then usually included for preparation and coating works (primers, corrosion protection, and so on); fittings, often based on a percentage of the total measured frame weight; and fire protection, usually measured on a m² basis, either by calculating the surface area of the proposed members or by applying a multiplier to the total frame weight. 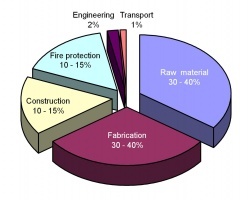 It is often assumed that a frame with the minimum tonnage will also have the lowest cost, however, as the figure below shows, the raw material cost typically accounts for around 30-40% of the total frame cost, with fabrication costs also accounting for 30-40%. 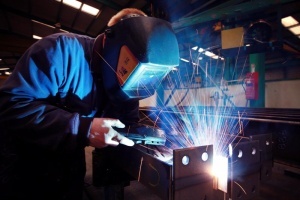 For more complex frame designs, with higher proportions of non-standard sections, complex connections or specialist systems with higher fabrication requirements, the overall rate per tonne is likely to be higher than for a standard frame. It is important to recognise that the steelwork contractor’s overall cost is driven just as much by the time taken to fabricate the frame as it is by the tonnage of material used. An approximate rule of thumb is that 20 hours of fabrication time is roughly equivalent in cost to around 1 tonne of raw material. The construction of the steel frame typically accounts for around 10-15% of the total frame cost. It is therefore necessary to consider whether there are features of the proposed building that would significantly affect the erection cost as this will see a corresponding impact on the total cost of the frame. The extent of repetition, piece count, the type of connections to be used and access can all have a significant impact on the cost of constructing the frame. For example, a long span layout may have a higher overall frame weight, but it will be erected faster than a short span frame due to the reduced number of beams and columns. Similarly, repetitive structures not only bring cost savings during fabrication but a repetitive grid with standard components will also reduce erection time. By gaining a greater understanding of the likely impact of the proposed design on the construction programme, preliminaries allowances will also be better informed. Individual buildings with different functions in varying locations will necessitate different approaches to the structural frame design, form and configuration. There are also many choices for the structural products used to form the steel frame. When producing cost estimates as the design is developing, information should be sought on the proposed structural products and systems, and any related considerations that could influence the choice, such as the strategy for integration of services. The most common structural steel construction products are rolled I and H Sections, known as universal beams (UBs), and universal columns (UCs) rspectively. The top and bottom horizontal elements of the ‘I’ and ‘H’ are the flanges, and the vertical or connecting element is the web. Other common products are structural hollow sections, which are generally square (SHS), circular (CHS) or rectangular (RHS). Fabricated plate girders can also be used to support heavy loads or span long distances beyond the capability of the largest standard rolled I-Sections, for example in bridges. They are typically I-sections made up of three plates welded together to form the flanges and web. 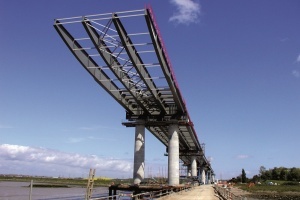 For very long spans, trusses comprising of horizontal, vertical and diagonal members are often used to achieve the most economic solution, e.g. in the roof structures of large industrial buildings. It is important to gain information on the proposed profile types as the same tonnage of each of the different profiles will have a different cost due to the differing fabrication and erection requirements. The specific building configuration can at times lead to significant increases in the volume of steel required for the frame compared with a more typical solution, for example universal columns (UCs) can be used as beams to create shallower floors. This approach can double the weight of steel required compared with a deeper universal beam (UB) approach, but it may result in reducing the height of the building, with corresponding savings to the cost of the cladding and will also reduce the cost of fire protection. During the costing of the structural frame, the availability of the products being proposed should also be considered. Despite possibly being lighter or more cost effective on paper, some products may incur higher costs due to limited availability, as well as a potential programme impact if they cannot be readily sourced. Early discussions with a steelwork contractor will identify any products or systems where availability may be an issue and enable this to be fed back to the design team or incorporated in cost estimates through adjusted allowances. Popular rolled sections may be manufactured up to 3 or 4 times more often than less common rolled sections and in some circumstances it may be more cost effective to use other, potentially heavier options which are more readily available. In recent years the availability of some of the larger steel rolled sections in strength grade S275 has become limited, as the market has moved towards the higher standard strength grade S355. British Steel has reported that order volumes for grade S275 in rolled sections sizes from 203x203UC and 356x127UB and above, has reduced to such an extent that availability can no longer be guaranteed. However, as grade S355 material is stronger than grade S275, there are very few situations where this is an issue. When the primary and secondary members have been designed, quantified and costed, consideration needs to be given to cost allowances for other related items, in particular connections and fittings. During detailed cost planning, a separate allowance, often expressed as a percentage, is generally included for connections and fittings to cover additional plates and other items at column bases, beam-to-beam and beam-to-column connections, bracing connections and column splices. 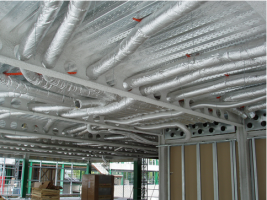 In a typical multi-storey building, fittings and connections can comprise 5-10% of the frame by weight, but can account for a significant higher proportion of the total frame cost as the cost of connections is largely related to their complexity rather than their weight. Generally, while there are many options for the connection and fitting design, the most cost effective approach will have a high level of standardisation and repetition to take advantage of reduced material costs, quicker fabrication and ready availability. For complex structures standard connections cannot always be used and in these cases cost allowances will need to be higher. Site conditions should also be considered as this can increase the proportion of the connection cost of the total frame, for example if it is necessary to have spliced beams to erect a steel structure inside an existing building. The key is to achieve the best balance between material cost and the cost of fabricating the connections. Initial designs may utilise the lightest columns and beams in an attempt to reduce costs but this can necessitate additional welded stiffeners, adding cost and weight to the design. Small increases in the beam or column weights may enable the stiffeners to be omitted, reducing fabrication costs and therefore the total cost of the frame. A key consideration during detailed cost planning is the required fire rating for the structure and the choice of fire protection materials. 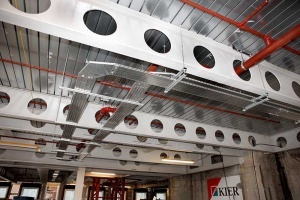 Fire protection can account for around 10-15% of the steel frame cost in commercial multi-storey buildings, so this key cost element should not be overlooked. As with all construction materials, when temperatures increase in a fire, steel begins to lose its strength. Fire protection is used to increase the time taken for the steel to reach its limiting (failure) temperature and allow occupants sufficient time to escape the building. Fire ratings for buildings are expressed in terms of the length of time the structure must remain structurally sound in a fire (e.g. 60 minutes) and generally depends on factors such as the type of building, its occupancy and the height. Design studies on fire protection options should also review whether it would be more economical to perhaps use slightly heavier structural members, which may allow the fire rating to be achieved with a reduced volume of fire protection materials and therefore at a reduced overall cost. Heavier sections require less fire protection than lighter sections as the thicker plate inherently resists fire for longer. For large or complex projects, it may also be beneficial to carry out a specialist fire engineering study. Specialist fire safety engineering involves a risk-based approach to design, which considers where the actual risks in fire are, rather than relying on the more simple guidance contained in prescriptive documents such as Approved Document B. This approach can lead to reduced fire ratings for some elements of the structure and therefore reduced costs of fire protection, without compromising safety. When the fire rating for the project has been established, the selection of the appropriate fire protection materials is important, as there can be significant cost differences between the methods. It may be useful to seek advice from the supply chain before finalisation of the design. In reality it is likely that a mixture of fire protection methods may be used on a proposed development, for example, non-aesthetic thin film intumescent coatings to beams with aesthetic boards to visible columns. Thin film intumescent coatings are paint-like materials which are inert at low temperatures but which swell when heated to provide insulation to the steel. Up to 90 minutes resistance can be achieved at a competitive cost and 120 minute is achievable at a premium. Thin film intumescent coatings have aesthetic benefits where exposed steelwork is part of the design as the shape of the underlying steel is still apparent. 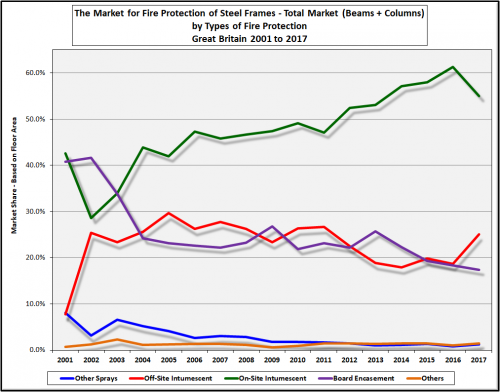 Application costs have reduced through improved technology and increased competition and they are now the predominant method for fire protection in the UK, as shown above. Off-site applied intumescent coatings have also become increasingly popular in recent years, with the advantage that they can reduce programme times, bringing both cost savings on site and an earlier building completion. As the application is carried out under factory conditions, high standards of quality are also achievable. Board systems are a common method of fire protecting structural steelwork. Board systems provide a clean, boxed appearance and can be pre-finished or suitable for decoration. They are also a dry application that should not affect other trades or the critical path. However, they can be a relatively expensive method, particularly if they are used as part of a decorative system. Boards can also be slower to apply than some other methods and fitting around complex details may be difficult and time consuming, which can lead to additional cost. 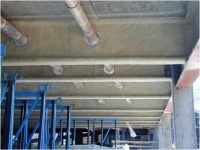 Cementitious sprays were a popular method of fire protection until the mid-1990s, particularly for non-visible steelwork. The main advantage was that application costs were significantly less than boards and costs did not increase significantly for higher fire resistance times, as the labour and application equipment was already accounted for. However, the finish is not considered visually appealing and as spraying is a wet trade it can require surrounding areas to be sealed off, increasing the time on site and resulting in higher overall construction costs. The use of Cementitious_sprays has declined markedly over the past decade, but it retains a niche the UK fire protection market, especially in tall buildings with high periods of fire resistance. 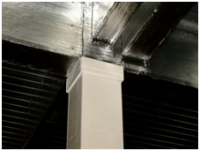 Until the late 1970s Concrete encasement was probably the most common form of fire protection for structural steelwork. However, since the introduction of lightweight systems such as thin film intumescent coatings, boards and cementitious sprays It is found only in specialist applications. It may still be used where resistance to impact is important, such as in some car parks and industrial applications. However, it is generally expensive and time consuming on site, as well as impacting on the usable space of the building. For complex structures or to address a specific design requirement, the structural frame design may include specialist systems, such as cellular beams, shallow floor construction, or steel bearing piles. The methodology for the cost analysis of specialist systems should not be limited to the comparison of structural frame costs in isolation. The impact of the use of the system on the cost of other elements should also be considered. As the specialist systems themselves are often more complex and from limited sources, the cost for the structural frame itself may be higher than if a more standard system is used. However, potential benefits such as a quicker programme (reducing the cost of preliminaries), or shallower floors (reducing the cost of cladding), can result in a lower overall cost for the building as a whole. For long spans, floor beams often need to be deep in order to achieve the required stiffness, which may lead to relatively heavy rolled sections being required. Lighter sections can be fabricated from steel plate or from standard rolled sections to form cellular beams. These are also used where a high degree of flexibility for the routing of services is required, The depth of these fabricated sections is flexible to suit the design requirements and openings can be formed to facilitate the services. While the overall rate per tonne of a cellular beams will be higher than for a standard rolled section, their use can result in savings in the total frame weight of up to 30%. They can also bring other benefits, such as a reduced depth of floor and service zone, which will result in savings on cladding costs. In shallow floor construction the steel floor beam is contained within the overall depth of the floor slab. Shallow floors might be employed to address requirements for a flat soffit and unhindered services distribution, or to reduce the overall depth of construction for buildings that have a restricted overall height, or again to reduce cladding costs. Steel H or Tubular bearing piles may be a good solution for some structures, particularly in difficult ground conditions. They can be easily installed, with minimal noise, close to each other and around existing buildings. There are also programme benefits as the piles are delivered ready for installation and can be loaded immediately after driving. 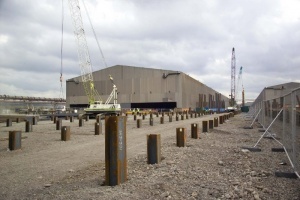 Steel piles also minimise soil displacement during installation, which has associated sustainability benefits and they can also be extracted at the end of a building’s life, enabling the site to be returned to its original condition if necessary. For specialist systems, especially where the manufacture and supply is from limited sources, market testing is particularly important as current and future levels of demand can have a significant impact on availability, lead times and cost. Early market testing is important to improve the accuracy of initial estimates and a dialogue with the supply chain is important during the detailed cost planning stages. The supply chain can provide valuable information on the current availability of products and specialist systems, feedback on the complexity of the proposed structure and its connections and current lead times. 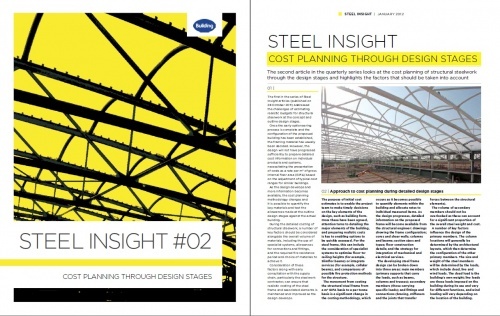 It is useful to recognise that when a cost consultant asks a steelwork contractor for a rate per tonne on a product basis, there are a number of frame, building and site-specific factors that will influence the accuracy of the estimate.